Align yourself with the Luxury Residences of The Chandler Condominiums. This 3bd / 2.1ba unit exudes elegance and is among one of the most desired tiers for its lake views from every room ! Walk into a dramatic foyer which leads to exquisite horizon views from the spacious living & dining area, great for entertaining. Your Gorgeous master bedroom is complemented with a full marble master bath featuring dual vanity and stand up shower. This unit offers a functional floorplan, amazing closet space , side by side washer & dryer as well as generous sized bedrooms. 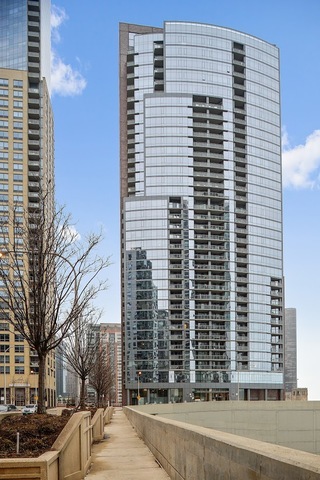 Have front row seats from your balcony to Navy Pier's Summer Fireworks in addition to being within walking distance to Michigan Ave., Millenium/ Maggie Daly & Grant Parks. Steps from the Access to Chicago's Underground Pedway which is perfect for inclement weather. 2 parking spaces available. Additional $50K for 2nd space. Look no further... you are home! Property information last modified by seller on Thursday, January 31, 2019, 12:05 AM CST. Information Deemed Reliable But Not Guaranteed. Unauthorized duplication, use, or linkage is prohibited. The information on this web site is for personal, non-commercial use and may not be used for any purpose other than to identify prospective properties consumers may be interested in purchasing. Monthly Payment Calculator results are for illustrative purposes only, not a financing opportunity; calculations assume a 30-year fixed-rate mortgage and do not include closing and other costs. Property Tax on NEW properties is estimated at 1.5% of Listing Price for payment calculation purposes; actual value may be higher or lower.